When comet ISON was discovered in the autumn of 2012, astronomers hoped that it would eventually light up the night sky to become a "comet of the century". Orbital analysis showed that the sungrazing intruder from the outer reaches of the Solar System would pass only 1.2 million kilometres above the Sun's visible surface on 28 November 2013. During the final phase of the approach to perihelion (its nearest approach to the Sun), the comet's tail became increasingly faint. It was clear that ISON's activity had ceased or that the nucleus had completely disintegrated. 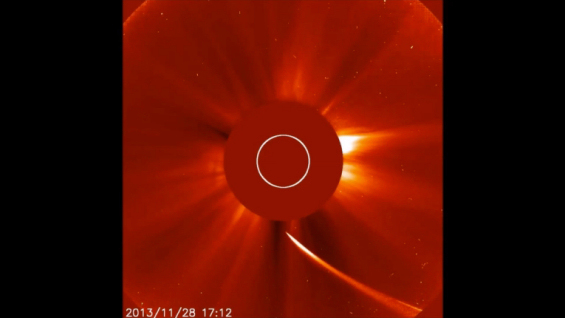 Hours before ISON reached perihelion, stunning images taken by SOHO's Large Angle and Spectrometric Coronagraph (LASCO) showed the bright, elongated tail of the onrushing comet. Unfortunately, ISON's trajectory took it so close to the Sun - about 1.2 million kilometres above its visible surface - that the final phase of the encounter was obscured by LASCO's occulting disc, which blocks light from the Sun to create an artificial solar eclipse. Researchers at the Max Planck Institute for Solar System Research (MPS) turned to the Solar Ultraviolet Measurements of Emitted Radiation (SUMER) instrument in order to reconstruct the comet's behaviour during its final hours. The SUMER spectrograph on board SOHO was the only instrument capable of obtaining comet data during the final minutes of its approach to the Sun. "The only instrument that could obtain serviceable data at this time was SUMER," says Werner Curdt from the MPS, first author of a paper in the latest issue of the journal Astronomy & Astrophysics. Curdt has been head of the SUMER team since 2002. "For everyone involved, this was a huge challenge," he adds. "The instrument was designed to investigate plasma flows, temperatures, and density in the Sun's hot outer atmosphere, not to detect a comparatively faint comet." By operating the instrument in camera mode, the researchers were able to record images of the comet's tail in far ultraviolet light with a wavelength of 121.6 nanometres. This light was emitted from the solar disc and reflected by the dust particles into space. The SUMER data showed the dust tail between 17:56 and 18:01 (GMT) on 28 November, shortly before closest approach. The images showed a slightly curved, pointed tail with a length of at least 240 000 kilometres. No signs of a particularly bright area were found at the position where the comet's active nucleus was predicted to be. To understand what processes generated this tail shape, the researchers compared the images with computer simulations. They calculated what the tail would look like, after making certain assumptions about the size of the dust particles, their speed and the time of their emission. Spectral information was also obtained by SUMER, starting at 18:02 (GMT). The instrument was repointed every ten minutes to track the comet, but most of these spectra had an extremely low signal, indicating an absence of cometary gas or plasma. "Our measurements and calculations indicate that ISON ran out of steam before perihelion," says Curdt. "During our modelling of the event, we were not able to reconstruct anything resembling our images, assuming that ISON was still active during the SUMER observations," says comet researcher and co-author Hermann Böhnhardt from the MPS. Instead, the MPS model most consistent with the observations indicates that the comet stopped producing dust and gas hours earlier. Whether the nucleus completely disintegrated cannot be settled for certain, according to Böhnhardt. However, several pieces of evidence indicate that this was the case. The arrow-shaped coma of the comet indicates that there was a short, violent outburst which released a great amount of dust, 8.5 hours before it was due to pass by the Sun. Calculations show that the comet must have emitted around 11 500 tonnes of dust at this time. "It is most likely that the final break-up of the nucleus triggered this eruption, abruptly releasing gas and dust trapped inside the nucleus," says Werner Curdt. "Within a few hours the dust production stopped completely." "SOHO has now been sending back a stream of data about our nearest star and thousands of sungrazing comets for more than 18 years," says Bernhard Fleck, ESA's SOHO project scientist. "Observations such as those made of comet ISON show that the observatory still has an important role to play in improving our understanding of the Sun and its influence on the planets and other objects which orbit around it." SOHO (SOlar Heliospheric Observatory) is a project of international cooperation between ESA and NASA to study the Sun, from its deep core to the outer corona, and the solar wind. SOHO monitors the Sun constantly from a privileged point in the Sun-Earth system, the first Lagrangian Point (L1). Located between the two celestial bodies, at a distance of about 1.5 million kilometres from the Earth, SOHO enjoys an uninterrupted view of the Sun – something impossible to achieve from a ground-based observatory due to our planet's rotation.